Flour Sack Towels in solid, seasonal, and printed designs, by Kay Dee designs, DII, Tag, Mary Lake Thompson, and more! Amor Flour Sack Towel, by Montgomery Street, a division of Mary Lake Thompson. Unique artwork reproduced on a 100% cotton flour sack dishtowel. Measures 30 x 30 inches. 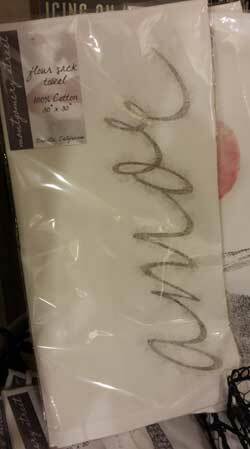 Cherry Tree Dishtowel, by Tag. Cotton flour-sack dishtowel printed with cherries and a plaid border (right towel in photo). Measures 18 x 26 inches. 100% cotton. Part of the Citrus Kitchen Collection. 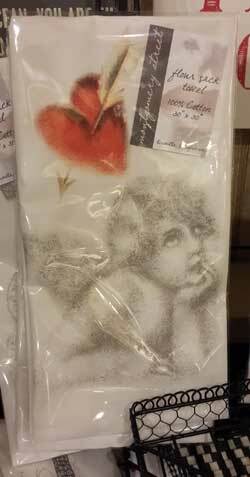 Cupid Flour Sack Towel, by Montgomery Street, a division of Mary Lake Thompson. Unique artwork reproduced on a 100% cotton flour sack dishtowel. Measures 30 x 30 inches. Dishes Tea Towel, by Primitives by Kathy. 100% cotton flour sack towel in classic Primitives by Kathy black and white style! 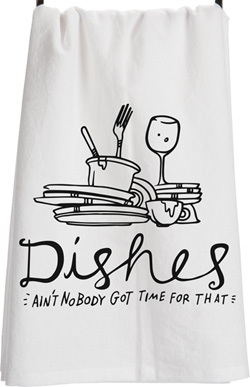 This one reads: Dishes, ain't nobody got time for that! Measures approx 28 x 28 inches. 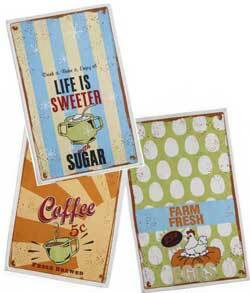 Life is Sweeter Flour Sack Dishtowel, by DII. This retro-inspired baking towel reads "Life is sweeter with sugar" against a light blue and cream striped background. This is for the towel in the Upper Left in photo. 100% cotton, machine washable. Measures 18 x 28 inches. Lint-free, fast drying (ideal for glassware!). Olive Branch Tapenade Flour Sack Towel, by Mary Lake Thompson. Unique artwork reproduced on a 100% cotton flour sack dishtowel. Measures 30 x 30 inches. Retro Baking Flour Sack Dishtowel by DII. 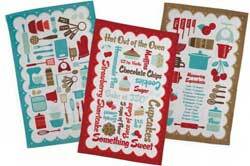 Features a retro red, aqua, and brown color palette, and reads: "Hot out of the oven," and "Something Sweet!" This is for the towel in the MIDDLE with the red border. 100% cotton, machine washable. Measures 18 x 28 inches. Lint-free, fast drying (ideal for glassware!). 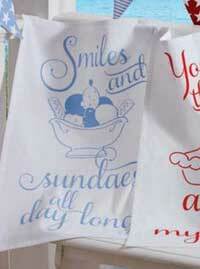 Smiles and Sundaes Dishtowel, by Tag. 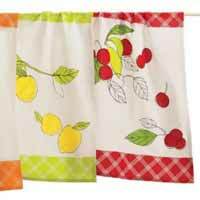 Cute dishtowel reminds you of some of the best things summer has to offer. Bold "sundae" graphic and stylish typographic elements are set against a white background. Bring some smiles and sundaes into your kitchen! Measures 26 x 18 inches. Machine washable. Wash & Dry Flour Sack Dishtowel, by DII. 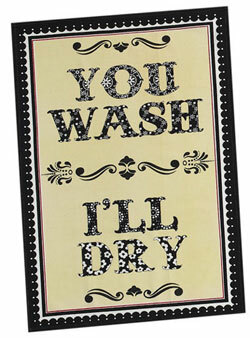 Features a black, white, and cream color palette, and reads: "You wash, I'll dry!" 100% cotton, machine washable. Measures 18 x 28 inches. Lint-free, fast drying (ideal for glassware!). You Send Me Flour Sack Kitchen Towel, by TAG. This flour sack towel honors the classic love song! "Darling you send me, I know you send me, Darling you send me Honest you do, honest you do!" 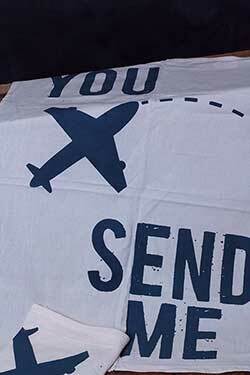 White cotton flour sack towel printed with "you send me" and airplane in blue. Attached hang loop. Machine wash cold; tumble dry low. Measures 18 x 26 inch.